Home › Uncategorized › Archaeology at Ronaldsway – How cool is this? Archaeology at Ronaldsway – How cool is this? The recent extension of the runway at Ronaldsway Airport prompted an important archaeological dig at the site before valuable information about our forebears was lost forever. Local Archaeologist Andrew Johnson, from Manx National Heritage, stated that work which had taken place at the site of Ronaldsway Airport in 1936, when it was known as the Ronaldsway Aerodrome, revealed some interesting finds. Workers initially found a sizable number of ancient graves, but close by were many skeletons thrown together in a random fashion. This led to speculation that what they had discovered was a mass grave and inevitably associating this gruesome find with soldiers killed in the bloody Battle of Ronaldsway in 1275. Later in 1943 with further developments underway other interesting finds were unearthed, including the famous Neolithic house. Measuring 24’ x 13’ and with a hearth near its centre pottery also found on the site was thought to be of crude design, but axes and arrowheads also located were reported to be of good standard. But recent excavations at Ronaldsway unearthed a fine example of a Mesolithic dwelling, which came as something of a surprise as people from this period were not thought to live in houses! Considered to be approximately 8,000 years old it is far older than anything else discovered at this site. Living and feeding close to nature lots of microliths were also found. Usually made of flint this was a small stone tool worked to a sharp edge and used to form the points of hunting weapons. 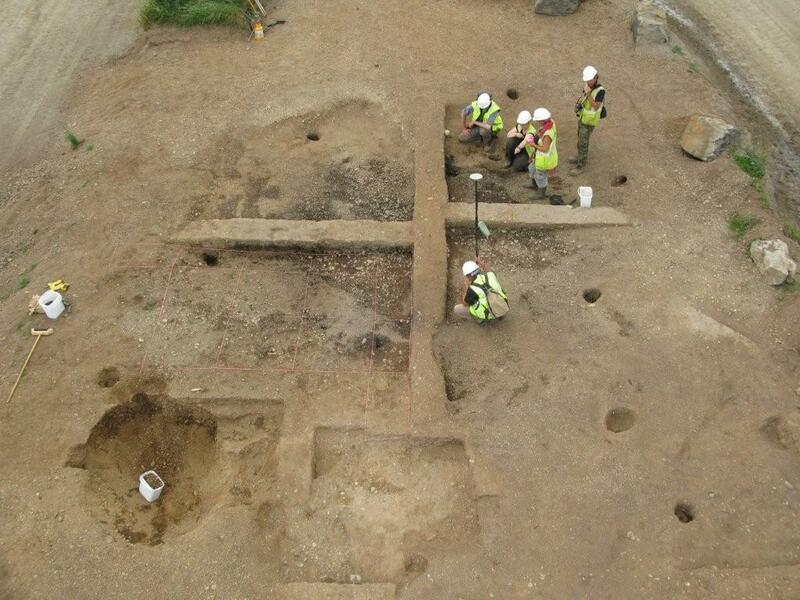 The discovery of a circle of post-holes suggested that the Mesolithic house was structured not unlike a tepee. Inordinately fond of shell fish a large number of discarded shells were found at the site, but Andrew Johnson believes that foraging was not the onerous task we might believe and that the Island was a good place to live even then. Right from the beginning valuable close co-operation was initiated between the engineers, archaeologists and the Isle of Man Government which ultimately paid dividends. During archaeological excavations at Ronaldsway, the skeleton of a man who died during the Bronze Age was found bearing the marks of a violent death. A new exhibition at the Manx Museum examines the evidence uncovered in excavations on the Island revealing how he lived and offering the first opportunity to see the sole possession buried with him. There’ll be artifacts on show that haven’t been displayed before, as well as replicas to show some of them in their original glory. The exhibition opened at the Manx Museum, Douglas, on Saturday 18th September and runs until May 2011. Admission is free.